Glazed Ham is a perfect holiday recipe. This glazed ham recipe boasts sweet, smoky, spicy flavor with an easy Cherry Chipotle Glaze! Glazed ham is an easy and delicious holiday recipe option. Perfect for larger gatherings and having leftovers too. 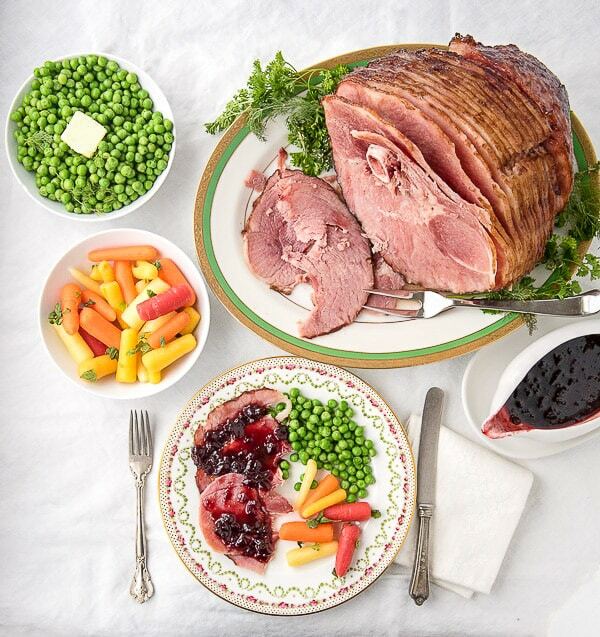 This Cherry Chipotle Glazed ham makes a beautiful Christmas ham recipe or Easter ham recipe. The sweet, smoky, spicy glaze is always a hit with diners. Understanding the difference between ham types is helpful in deciding which to use. This handy guide about ham will give you lots of details about types of hams. Ham which has been removed from the bone and compressed back together. It is easy to slice, though some believe it lacks flavor as compared to those with bones due to the flavor imparted from the bone. Ham which remains on the bone, believed to be some of the most flavorful though requires carving around the bone. 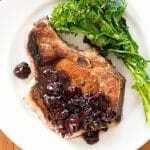 The same as a Bone-In ham however it has been pre-sliced making for easy removal of slices after warming. This is the ham type used in today’s glazed ham recipe. Because these types of ham are already cooked, the trick is to reheat them to a safe temperature while retaining their moistness. Over-cooking a ham leaves them dry and stringy to eat. 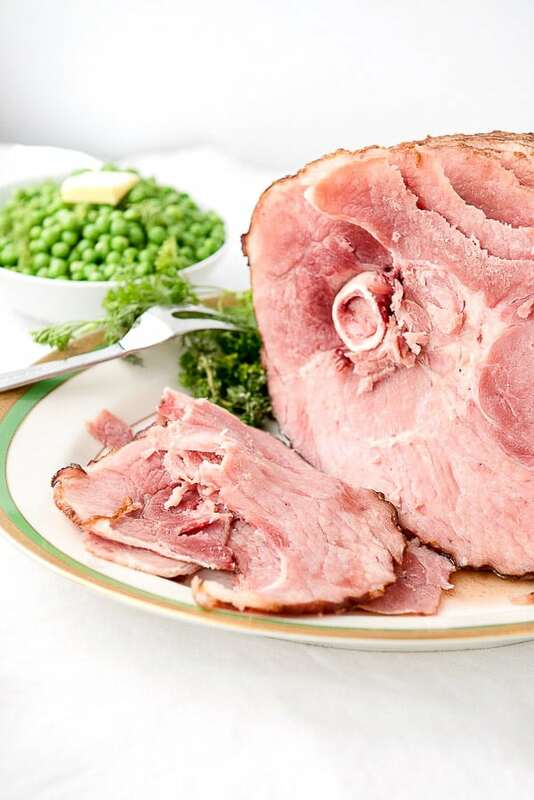 Reheating a ham is best done on lower temperatures with the ham enclosed in almost a steam tent using foil and a small amount of water in a roasting pan. It takes a few hours to bring them to temperature, and twenty extra minutes to cook when the glaze has been added. The patience expended is well worth the wait! I love this glaze. I mean, ‘I’d-drink-it-through-a-straw-love’ this glaze. It’s a sweet and spicy glaze that marries beautifully with the salty ham. The Cherry Chipotle Glaze coats the glazed ham in a deep garnet-red. It’s a wonderland of sweet, smoky, spicy flavor. It’s my favorite glaze yet! Generally, hams are purchased for holidays like Christmas hams and Easter hams. Have you ever tried to buy a ham outside of those time frames? Between Christmas and this time of year, hams are held at suppliers until they are mass released to the ham-buying public a few weeks before Easter. It happens all at once and most butchers cannot get them beforehand; or if they special order they must order a case. ‘Nugget Hams’, small, boneless 2-3 pounds that look like slightly larger than a softball are easier to find year-round but are often too small for a larger dinner. TIP: Buy an extra ham to put in the freezer if you want the option of having one whenever you are feeling like it. For the full detailed recipe please refer to the recipe card at the bottom of the post. Place the ham cut side down in a roasting pan; add water ¼-inch deep. Tent the ham with foil, crimping it down on the pan sides to fully enclose the ham. Cook until the ham registers 100 degrees at the thickest part (do not let the Instant Read thermometer touch the bone for most accurate reading); around 2- 2 ½ hours. Make the glaze at 2 hours by combining the glaze ingredients in a medium saucepan. Bring to a low boil for 5 minutes; remove from heat. Remove ham from the oven and remove the foil. Baste the ham with the glaze twice. Reserve remaining glaze for serving. Return ham to oven to cook uncovered for 20 minutes. 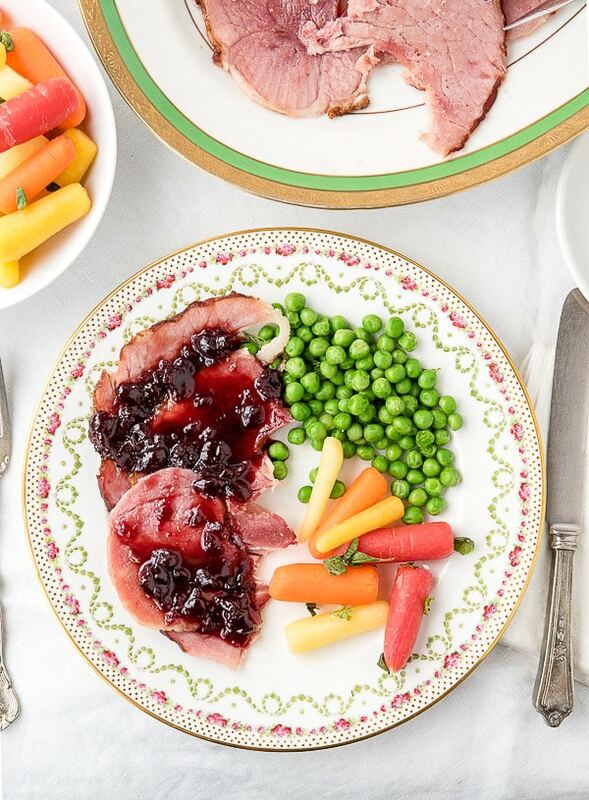 This luscious glaze will turn your Easter or Christmas ham into a holiday favorite! The sweet, smoky, spicy glaze elevates the juicy ham to another level! After basting, there will be approximately 3/4 cup of glaze for serving at the table with the ham. 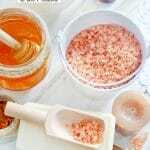 Should you wish to have more glaze, the glaze portion of the recipe may be doubled. 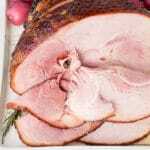 Place the ham cut side down in a roasting pan and add water ¼ inch deep. Tent the ham with foil, wrapping the foil over and crimping it down on the pan sides to enclose it fully; place in the oven. Cook until the ham registers 100 degrees when measured at the thickest part; about 2 hours to 2 ½ hours. Around the 2 hour mark, make the glaze. Combine the cherry preserves, cumin, cinnamon, lime zest, orange juice and Adobo sauce in a medium saucepan over medium heat. Bring to a low boil, stirring constantly and cook for 5 minutes. Remove from heat. Remove the ham from the oven. Remove the foil and increase the oven temperature to 350 degrees. Baste the ham with the glaze, twice. Reserve the remaining glaze to serve at the table. Return the ham to the oven and bake uncovered for 20 minutes. Wow! I think I just found the perfect glaze! I am loving everything about this recipe, but especially the glaze.. So good. That cherry chipotle glaze is everything! The most amazing flavors are going on in this ham. This sweet, spicy, smoky glas is fabulous with ham! Oh my stars this glaze sounds so amazing! Ham is my most favorite part of our Easter meal! I HAVE to try this glaze (it’s making my mouth water just thinking about it!). This looks like the perfect ham for an Easter celebration! I would love to have these leftovers hanging around. I’ll bet they wouldn’t last long. 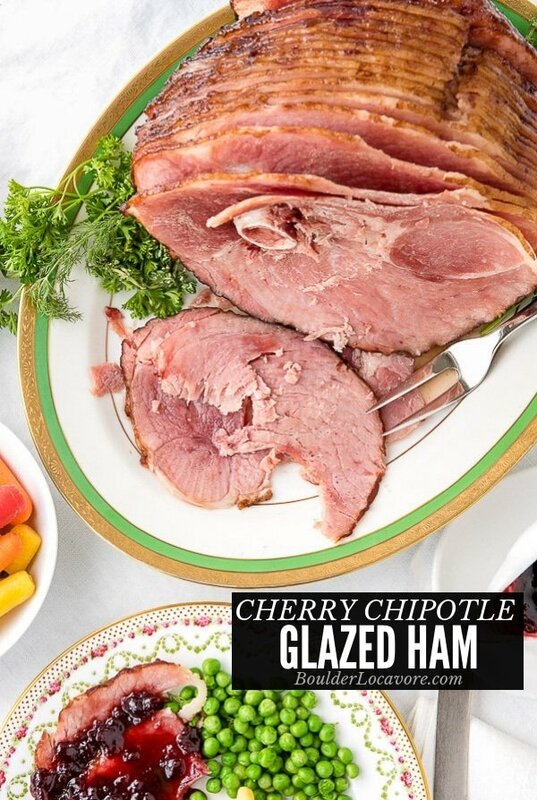 Love the flavor pairing of cherry, chipotle and ham! Unique and so tasty! I just love that sweet and smoky flavor! 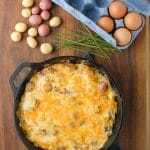 I am definitely going to try this recipe out for Easter! This flavor combination is everything! It’s a great addition to the ham. Wow, this ham looks amazing and the flavors, yummy! The best flavor combination for ham ever! So delicious! Amazing ham! I love this glaze! 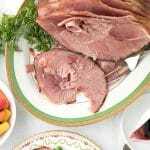 This is a beautiful spiral cut ham recipe! I love the spicy yet sweet glaze that you’ve added to it. WOuld be so good for Easter dinner. Could this be done in a Crock-Pot? I really like your cherry chipotle glaze! It looks packed with flavor! Thank you Kathy! It really is and as we’ve been having leftovers the flavors really penetrate the meat leaving it just as good as the first day. Yum. Great idea to jazz up an Easter ham! It’s so easy to get into a holiday recipe rut doing the same thing every year, isn’t it? I love this as a new spin on classic ham. Steps it up a notch! I never really thought about it, but it’s true, I don’t think I have ever seen a ham outside of holiday time. I guess we need to get out fill at Easter, and I absolutely love ham, or pretty much most meat with cherry sauce. Ha, ha, Heather! True about ham in terms of loving it; maybe because we CAN’T get it anytime we want. Candidly I’d eat this cherry glaze on just about anything!